We were informed by the authorities that our client, Mehdi Maleki, was released from detention and his deportation order stopped yesterday after Sweden’s initial decision to implement his deportation on 13 May 2011. This victory is thanks to the efforts of concerned people around the world who called or wrote to Swedish Embassies and the Swedish Immigration Office to demand a halt to the deportation; the efforts of lawyer Bo Johansson of the Swedish Refugee Advice Centre; the work of others including UNHCR and Amnesty International; and around-the-clock action by organizations such as the International Organization of Iranian Refugees – Swedish Section, the International Federation for Iranian Refugees, the International Coalition for the Rights of Iranian Refugees, and Mission Free Iran. By halting Sweden’s deportation of Iranian human rights activist Mohammad Mehdi Maleki to Iran, the humane front has dealt the third such defeat this year to the cold, inhumane, and illegal politics of the Swedish government. It is on these bases that we go forward with our demand to change the current policies, official or unofficial, of the Swedish government towards refugees, and Iranian refugees in particular, who, if returned to Iran, face prosecution by the Islamic Republic under Article 7 of the Islamic Penal Code simply due to the fact that they have sought asylum abroad. We demand that no Iranian refugee be sent back to the hands of the Islamic Republic of Iran by the government of Sweden, and we extend this demand to refugees of other national origins facing similar pressures. We will pursue this demand from within the Swedish political system and, if need be, at the European Court of Human Rights in Strasbourg. 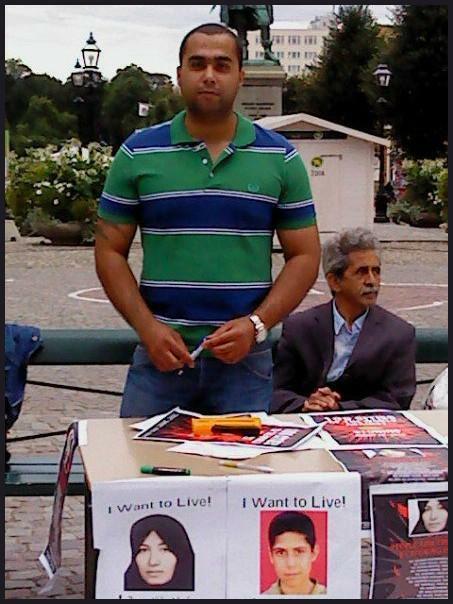 The gallery of images below shows the demonstration organized by the International Organization of Iranian Refugees – Swedish Section and the International Federation for Iranian Refugees in Sweden – both of these organizations were instrumental in putting people on the streets and securing the necessary support to stop the deportation of both Mehdi Maleki this week, and Sirvan Foroutan last week.